When we opened Auntie Pasto's some twenty years ago, we wanted to offer good homemade food for a fraction of what the others were and we managed to create a friendly neighborhood environment, just like back home. I was raised in the Italian neighborhood of Pittsfield, Mass. in the 50's and 60's. We ate most of our meals at home. 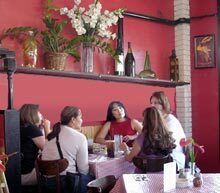 On special occasions we would eat at one of the Italian restaurants in the neighborhood. Wine list of about 20 wines, many offered by the glass. Draft & bottled beer. Vodka, Gin, Flavored Martinis, After Dinner Drinks. Groups up to 20 guests. Enjoy Auntie Pasto's on the go! Call ahead, then come down and pick up your favorite dish for a night in front of the TV. Piles of al dente pasta, good homemade breads, big ole' meatballs, sausage & peppers. Now, that was eating! Of course, you knew just about everyone in the place so there was always alot of chatter and laughter and energy going on. Nothing fancy, mind you, just good food and friends. Best Pasta -- Ilima Award.